So I decided I would challenge myself from time to time to write a short flash fiction story, about 200 words, about a photo that I had taken somewhere. I’d include the photo and the short story. I’m not letting myself think good/bad/stupid/indifferent but just posting them. Who knows? Maybe there will be story ideas here. And I can explore certain ideas, practice certain types of techniques in this quick and dirty little exercise. In the sun, which beat down on my head the way the sweat poured off my body, I thought in no time I would look like the creature in the chair. Who was he? What was his story? How could I tell his when I didn’t know mine? 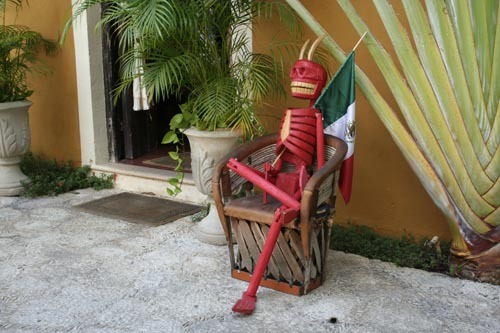 The colors of the skeleton put me in mind of the heat that beat down along with the chilies that had been in my food. Why was everything here so hot? Food, weather, sun. A child tripped over the skeletal creature sitting there, outside the shop, like it was nothing. The wooden bones began to topple to the side, like a toy tower. The child screamed. I settled into the chair, using the flag as an umbrella. Yet another visitor exhausted from the heat, waiting for his wife while she shopped, beneath a sweltering sun. A different child trips over my feet, falling down, beginning to cry. I leaned over to offer comfort as the mother swept her up. I toppled to the side, like the creature before, scattering into a hundred pieces just as my wife walked out of the store, packages in hand.